Vocal Engineer: John Reynolds. 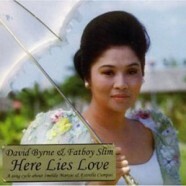 John worked with David Byrne on the vocals at CLEAR Studios for this collaboration with Fatboy Slim. This double CD features contributions from Martha Wainwright, Steve Earle, Florence Welch (Florence and the Machine), Tori Amos, Cyndi Lauper, Santigold, Roisin Murphy and Nellie McKay among many others.